Breeanna Urbanowicz received her PhD under Jocelyn Rose at Cornell University. Her work contributed to our understanding plant family GH9 and family GH10 glycoside hydrolases. Following her doctorate degree, she joined Dr. William York’s group in the Complex Carbohydrate Research Center at the University of Georgia for her first postdoc. 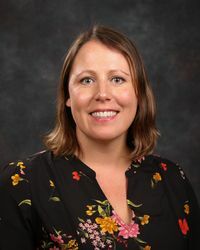 Currently, she is an Assistant Research Scientist at the Complex Carbohydrate Research Center and is a Project Lead of Plant Cell Wall Biosynthesis and Deconstruction in the DOE funded Center for Bioenergy Innovation. Her research centers on the biosynthesis and modification of plant cell wall polysaccharides. Much of her recent research has focused on the hemicellulosic polysaccharides xylan and xyloglucan as models to study plant glycopolymer biosynthesis, which led to the identification and biochemical characterization of several of the enzymes in the xylan biosynthesis pathway, including Xylan Synthase-1 (XYS1), Glucuronoxylan Methytransferase 1 (GXMT1) and Xylan O-Acetyltransferase 1 (XOAT1). GXMT1 and XOAT1 are enzymes involved in the addition of non-glycosyl substituents to polysaccharides and represent the archetypal members of the first known families of both polysaccharide O-methyltransferases (GXMT1) and O-acetyltransferases (XOAT1), which were both previously classified as members of protein families harboring domains of unknown function (DUF), DUF579 (PF04669) and DUF231 (PF13839), respectively. This page was last edited on 16 November 2018, at 15:12.